"Convicted" is a compelling and gripping novel that will have you turning the pages as you read the story of Jameel and Andrew. Jameel was convicted of a crime and Andrew was the police officer who arrested him. However, the story doesn't end there, but starts there. This is the story of how two men had an experience where their lives would forever be changes when they each surrendered their lives and turned to God. It is a powerful story of forgiveness, redemption, reconciliation and the gift of new life. I love how the story is told is present tense as we hear the first accounts by both Andrew and Jameel. This book is perfect because it relates to how the world and Christian culture are handling things today. We need to be more willing to forgive and move on, instead of being angry and holding on to hate. 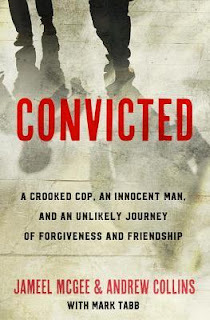 This book would be perfect for a church who has a prison ministry as it offers hope to those who are convicted of crimes they did not commit. It is also encouraging as it shows that people are failed, broken and need a savior even if they are in high positions in the world, such a police officers. It shows that no one is better than another. We are all equally loved by our creator. Thank you to Waterbook Multnomah for providing a complimentary copy for review. A favorable review was not required. I give this book 5/5 stars.